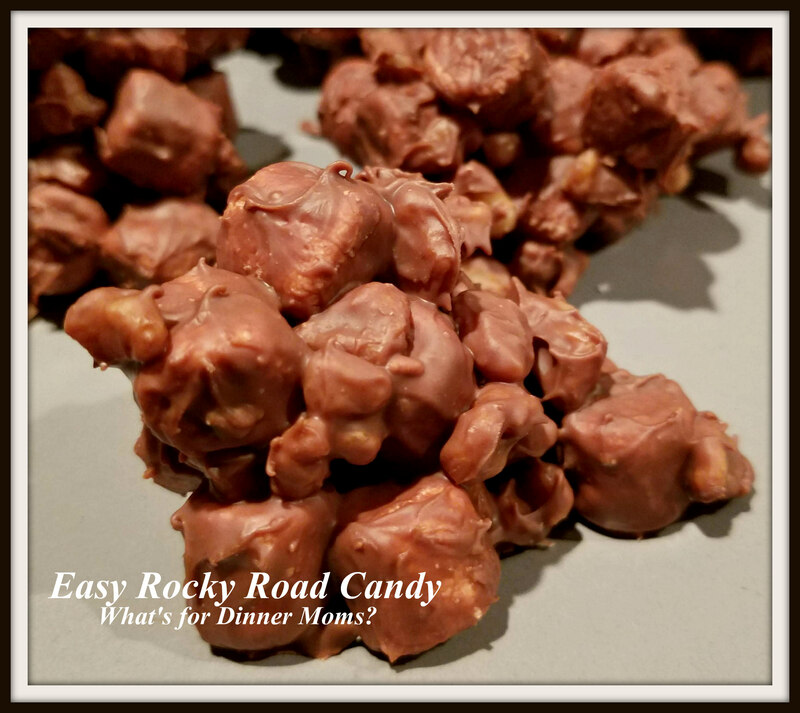 Christmas Cookies Week 2 (2019): Easy Rocky Road Candy – What's for Dinner Moms? This was so easy to make and I could see this being a nice filler on a cookie or sweets tray. It was super easy to make and you could easily make them slightly smaller and make so many more in a double batch! Remember you can change the nuts, add raisins, or even craisins and a dark chocolate would be delicious. Play with the recipe and make it what you like. 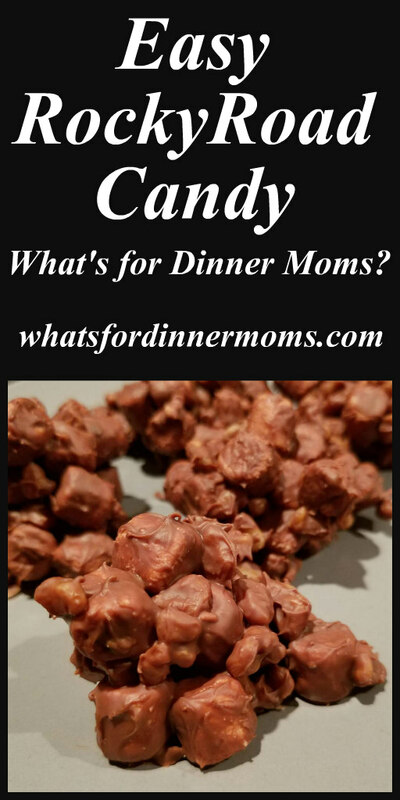 A simple chocolate candy that would make a great addition to any sweets tray or on its own. Prepare a cookie sheet by spreading parchment paper over the tray. Clear an area of your refrigerator to fit the tray to harden the candy. In a microwave safe bowl melt chocolate chips in 10 second intervals stirring between each stopping point. Be careful to melt chips and NOT scorch them. They melt quickly when they start to melt. Remove chocolate from microwave and stir in walnuts and then stir in mini marshmallows. Make sure the chocolate is not too hot or the marshmallows may begin to melt. Drop by heaping teaspoons or tablespoons (depending on how large you want your candy pieces) onto the parchment paper. Refrigerate candy for 30 minutes or so until hardened. Remove from parchment paper and store in a tightly covered plastic container in the refrigerator until ready to serve. I love that challenge! What can we make with ingredients in the house! Especially this weekend as we go into a nice snow storm!!! Us too!! I picked up extra ingredients to try a new recipe or two! Nice and simple recipe, Marci. Mine is much more difficult to make. Thank you!! When we have the time the more involved usually is better but sometimes simple is what is needed.